Probably with similar debates to the age old question of is it a sport or a game – what exactly deviates a puzzle from a game? Knowledge – If it’s not a mechanical puzzle you can “figure out” per se – do you have the knowledge to solve it? One thing we can decide for sure is that a puzzle has a definite ending. A jigsaw puzzle is complete when it’s fully assembled, the Rubik’s cube is solved when all of the sides are solid colors, a disentanglement puzzle is solved when it’s, well, disentangled. A puzzle, depending on its difficulty, makes you think. You need to figure out how you’ll solve it and this involves variable usage of the brain. While I don’t necessarily agree with the first statement, as there are plenty of puzzles that are not necessarily fun to everyone, I do agree with the second. There are several different types of puzzles, let’s go over some of the common ones to help identify their characteristics and therefore define puzzles. Logic puzzles – Riddles etc. 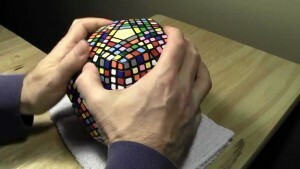 Maybe it’s the same, or maybe different for you, but I go through a few phases when solving puzzles. Another definition from The Random House dictionary answers the question “What is a puzzle” as “a toy or other contrivance designed to amuse, presenting difficulties to be solved by ingenuity or patient effort.” I guess this definition places a puzzle as one physical/mental entity and does not include non-enjoyable or non-toys as puzzles, which is the difference for me. I think that a puzzle is any problem that has a solution – whether or not the solution can be found or not is an entirely different story. I think in one of my next pieces I’ll write on whether or not the solution to some puzzles exists, or should exist. Until next time, happy puzzling!